Are you looking for a professional Dunham-Bush Pump Service in NYC? 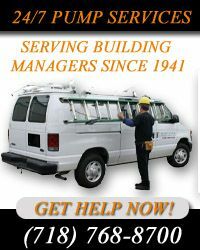 NY Pump and Motor is a Dunham-Bush Pump Service in NYC, that provides excellent pump services, since 1941. When you need pump services, you can trust the professionals at NY Pump and Motor's Dunham-Bush Pump Service in NYC to provide you with ptompt and professional pump services. Our well-trained pump service technicians are up to date with the manufacturer's service standards and are ready to service your pump system 24 hours a day 7 days a week. For more information on our Dunham-Bush Pump Service in NYC, call NY Pump and Motor today at (718) 768-8700!